So, would you like to know what I did this weekend? I am so excited I can hardly contain myself. You will probably have picked up that I have a bit of a thing about Norfolk Horns. Well I have decided to do something with it and have a wee project. And on Friday I took a whole load of fleece to the mill to be spun into yarn. All summer I have been tracking down flocks of Norfolk Horn with the aim of sourcing fleece from small local producers. I’ve been hunting up and down byways and highways, chasing leads. I’ve met some really grand folks who couldn’t have been more helpful and others who were less so. All were passionate about their sheep. I have to give thanks to them. The clippers were surprisingly heavy and vibrated strongly, nothing like the ones I use to clip Sean. I was a bit of a jessy and did a terrible job. I don’t think I will make a shearer! The flocks tend to be tiny. In general their fleeces are in such small quantities that they do not send them to the BWMB. It’s too complicated and doesn’t earn any money. The price for Norfolk Horn at last check was about 80 pence a kilo. The average fleece weight for a Norfolk Horn fleece is about 1.5kg so thats less than £1.50 a fleece. Selling via the BWMB won’t even cover half the cost of shearing. Other markets are hand spinners or selling on line. Here the price is better, £5 – £8 per fleece. But this is time consuming, reliant on word of mouth and networks and there are only so many hand spinners to go round. I wanted to do something about this. Can I source local fleece, pay a fair price and produce a yarn that is economically sustainable? This is very much a pilot project. We will see what the answer to these questions are in the coming months. On Friday the 13th October (an auspicious date) I packed all the fleece up into the back of the van and drove them to the Natural Fibre Company in Launceston, Cornwall for the next stage in the adventure. 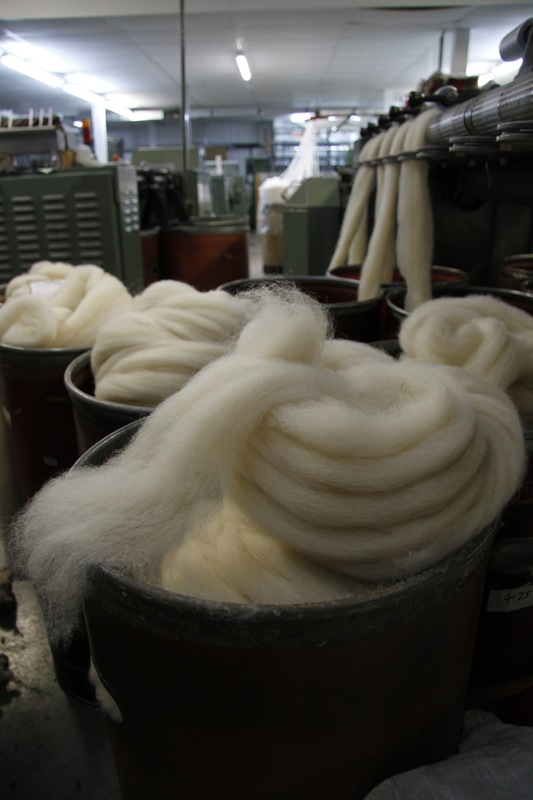 The Natural Fibre Company is a specialist in processing rare breed fibre. Its also the sister company to Blacker Yarns. I think it might be the largest small mill in the UK that spins both wool and worsted yarns under the same roof! Most importantly for me, in addition to a wealth of experience of spinning single breed yarns, they have tip top sustainability ethics and environmental credentials including a licence for organic production. The mill has been in Launceston, Cornwall since 2005. Though the company has a longer pedigree. It was started by Myra Mortlock in Methyr Tydfil in 1991 with her husband Phillip. In 2004 the business was taken over by Sue Blacker, one of their customers, and moved to Cornwall. 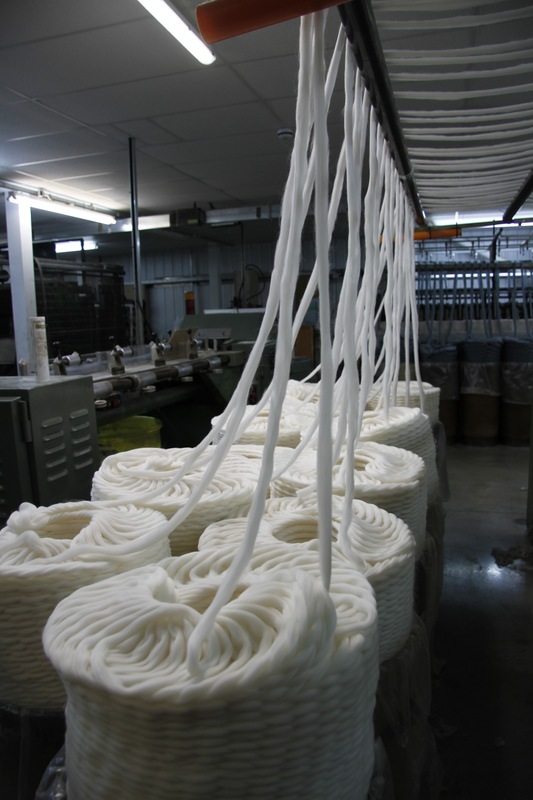 In 2008 the company installed a dye plant and launched Blacker Yarns. Quite a heritage. So on a wet windy Friday we pitched up with our three bags full and were met by Cyd. The mill itself is not what you would expect from the outside. As you pull of the A30 onto the Penygillam Trading estate you think this can’t be the right place but there it is at the end of the line. A very modest non-descript typical trading estate building that gives nothing away of the magic that is happening inside! We took our bags and put them on the scales with fingers crossed. The minimum quantity was 20kgs. I breathed a huge sigh of relief when the scales tipped in at 30kg. Cyd was wonderful, despite being ill and looking like death warmed up, she gave us a quick tour of the mill where Sean snapped away. I was so overwhelmed I forgot to take any pictures! We started up on the Mezzanine where the incoming batches of fleece were stored. After sorting, the first thing that happens is the scouring where the fleece is cleaned. It’s then carded into lovely fat fluffy rovings. After this the production line is split in to either woollen or worsted. The woollen spinning takes the carded fibre, which contains fibres of different lengths and arranged in all directions, and teases it out into the thinnest ‘sheet’ of fibre I have ever seen. This is then drawn into rovings. Which is then spun and plied. The worsted spinning takes the carded fibre and combs it a number of times to remove all the short fibres and aligns the remaining fibres in the same direction. This is what gives worsted yarn that sheen and density. The resulting tops are coiled like soft coiling snakes into drums. I love the beautiful symmetry of the coils. The tops are then spun and plied into lovely luscious yarn. The yarn is then finished as either skeins or balls on the amazing balling machine. You can take your own virtual tour of the mill if you like. Sssh don’t tell anyone but I had a good old squish of some of the beautiful Blacker Yarns. Oh my goodness, you should see what they have planned for next year! I could tell you but I think they would have to kill me. And the Samite!! I can’t wait to see those fleeces back as yarn. I will keep you posted.